Institute for Sustainable Energy Policies and Japan Renewable Energy Foundation have organized a multi-stakeholder research group “Sustainable Society and Renewable Energy” since December 2012. The research group consists of renewable energy developers, environmental groups and experts, and we discussed challenges and solutions for socially harmonized renewable energy development. Through the discussion, the members confirmed the necessity of renewable energy for the sustainable society and published the following report on sustainable society and renewable energy. 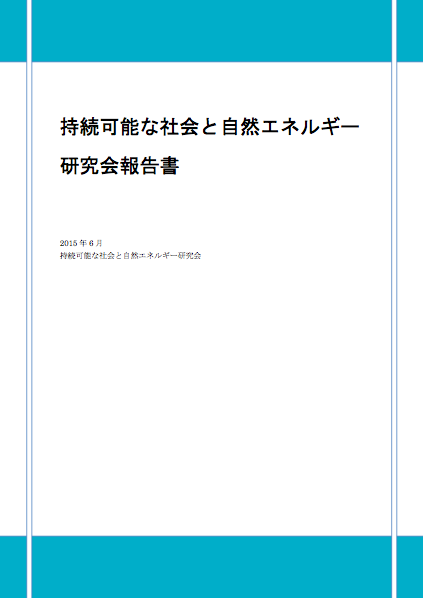 We compiled the results of discussion, such as “sustainable society and renewable energy consensus”, “basic idea of energy use in sustainable society”, “principles on sustainable renewable energy use” and “stakeholders’ activities and challenges for sustainable renewable energy use”, into the main report (*currently available only in Japanese). The consensus is compiled as a point of agreement among the research group members, not as a official statement made by the represented organizations. It is expected that the consensus and the idea on sustainable renewable energy would be shared and disseminated among broader stakeholders in the society. We agreed that renewable energy is the only sustainable energy resource when we aim to realize balanced sustainable development between societal fairness including future generations, and economic development in broader sense, which is based on the environmental conservation such as protection of biodiversity and avoidance of global warming. As the components of sustainable development, “sustainable energy” system requires use of renewable energy on the supply side and energy efficiency and saving on the demand side. Therefore, we need not only to save energy simply but also to increase efficiency of energy utilization equipment drastically in all sectors. And through the societal reform including industrial structure we need to reduce the amount of total societal energy demand without spoiling people’s needs. Not all the renewable energy projects automatically become “sustainable development”. We acknowledge that there will be some renewable energy projects, which are not “sustainable” depending on the ways of development and social consensus. Compared with other unsustainable energy (fossil fuel and nuclear), the risk of renewable energy that brings to environment and society is relative small but not zero. We take precautionary approach to renewable energy development in case of the risk of significant and irreversible impact. Because renewable energy development and utilization always involve environmental change both physically and socially, we premise social consensus among various local stakeholders. We take voluntary, administrative and institutional precautionary approaches to renewable energy development and utilization, such as land zoning, improved strategic environmental assessment. And also we aim to create new social model that will increase active involvement of local communities. Considering uncertainty and insufficiency of scientific knowledge as well as social consensus of times, we continually review and improve the ways of renewable energy development and utilization with standing on the common understanding and temporal consensus at that time.